In what seems like years but is actually just a couple of weeks OSU and Coach Meyer landed another recruit for the 2013 class today. Maybe us fans had gotten spoiled by the frantic pace of the first 2 months of Coach Meyer recruiting to save his 2012 class and we got use to daily recruiting pick ups and news. Coach Meyer did warn us that he wanted to slow things down for the 2013 class and get to know the recruits on a personal basis before both sides decided to marry each other in the recruiting process. Well we are a month into the 2013 class and we landed our 5th verbal commit today. 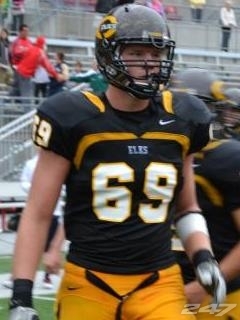 Evan Lisle is a 6’6″ 265 lbs 4* OT from Centerville, Ohio. He committed to OSU today via phone cal to Coach Meyer and the news was broke by Marc Givler of BuckeyeGrove.com. Evan Lisle is a huge OT recruit and ranked in the top 5 of Ohio recruits by Scouts. He is an ESPNU 150 recruit and ranked as the 83rd best recruit by Rivals. Evan fills a need at position we lack depth at and has the size and agility to play either right or left tackle. He needs to put on a little more weight but he has the athletic lean look Coach Meyer wants from his OLmen. he will have every chance to play early and often. I love this pick up!! Welcome to Buckeye Nation, Evan!